HAND HELD PROGRAMMER FOR DIGI-MOTOR 10860/10861/10866/10867 - NuComfort Supply Inc. 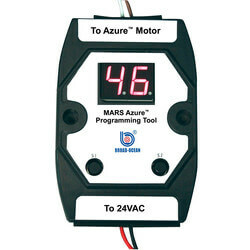 The Azure® Hand Held Programmer allows the Azure® Digi-Motor® (MARS No. 10860/10861) to be custom speed tuned to each application. Although the motor performs an auto sizing function that will correctly assign torque to each of the speed taps for the installed application, there may be instances when custom speeds are desired. Features: Allows blower speed to be reduced to the low end of CFM tolerance for improved dehumidification. Allows duplicate speeds to be set on multiple speed taps. Allows CFM to be maximized especially in high altitude applications. Provides speed tap flexibility for multi-stage systems.